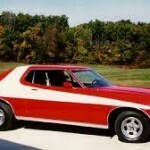 I distinctly remember sitting in Government class at HHS in 1977, looking out the window and seeing at 1976 Ford Gran Torino in Starsky and Hutch paint, stopped at the Cross Street stop sign. I decided at that moment that I wanted one of those cars. Still want one. Little did I know, that very car was being driven by my friend Ron Carter, who lived in Indy and was ditching school that day. I would meet and work with Ron for several years at Windy 100 in Chicago. It would be until a cold, winter’s day in 2000 when Ron and I realized he was behind the wheel that day.Funny how life works, huh?